One of the best ways you can support TouchArcade is by doing your Amazon shopping through a TouchArcade affiliate link. We’ve set up the easy to remember toucharcade.com/amazon too if you want to type that in or bookmark it. We get a small percentage of anything you buy through any of these links, which otherwise would just go to financing Jeff Bezos’s pool floaty drone delivery service or whatever else he’s up to now, and it goes a long way to supporting the site at no additional cost to you. These Amazon Items of the Day articles are all products we have used ourselves, and feel are things that the TouchArcade audience might be interested in! 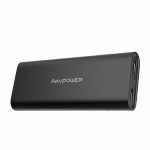 RavPower is another brand like Anker or Aukey that makes loads of great mobile accessories that are far cheaper than the sort of brands you can find at the Apple Store. I’ve had nothing but good experiences with all of them too, as the three companies seem to be in a pretty competitive war on sites like Amazon which has sent the prices for things like batteries, chargers, and cables lower than ever. (Which is great for us.) Today’s Amazon Item of the Day is actually three items from RavPower that they also are providing coupon codes for which make these already super cheap batteries even cheaper- One of them, with the coupon, is the cheapest it’s ever been. First up is the RAVPower 16750mAh Power Bank. Its regular price is $34.99, but if you use coupon code TOUCHPB010, it goes down to $21.99, which is the cheapest this battery has ever been. With 16,750mAh of charging capacity, you can charge an iPhone 8 Plus 3.6 times. Also, it can output 4.5A, so it can charge two devices at full speed, at once. 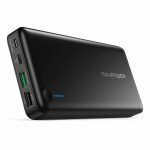 This battery weighs 10.7 ounces, making it a great overall battery pack to carry around with you daily. Next up is the RAVPower 26800mAh 3-Port Power Bank. Normally this battery pack will run you $56.99, but using coupon code TOUCHPB043 at check out brings it down to $39.99. Primary differences between this and the previous battery are that this one has three USB ports up from two, and 26,800mAh of power storage which according to RavPower is enough battery capacity to keep your iPhone charged for upwards of nine days of normal usage, charging it to full over six times. 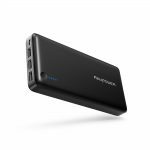 It’s also capable of 2.4A per USB port for fast charging, but the additional ports and power capacity come at a cost: This pack weighs 1lb, making it a bit more of a brick in your bag than smaller capacity batteries. Last, but not least is the RAVPower 20100mAh USB-C Power Bank. Normally priced at $51.99, using the coupon code TOUCHPB41 also brings it down to $39.99. With “only” 20,100mAh of onboard power, its capacity is slightly less than the previous battery but what it loses in capacity it gains in futureproofing with the addition of a USB-C port capable of charging things like laptops, the Nintendo Switch, and other USB-C devices. It also weighs 1lb, and is probably the better buy of these two batteries unless you just really have nothing that uses USB-C and want that slight bump in capacity. Additionally, it’s the only one with a QuickCharge 3.0 port on it, which probably means nothing to you unless you have a newer Android phone that supports the QC3.0 standard. I’m a big believer that you can really never have too many batteries, particularly with how many things charge over USB now. I’ve collected an embarrassing amount of them, and as new batteries come out that support things like USB-C or have other fancy features, my older ones get relegated to living in places like the glove box of my car or in random bags I use so I’m never somewhere that I can’t charge my phone. Additionally, if you’ve got a battery already, these companies have made some oddly huge advancements in maintaining the same capacity (or in some cases even more) with way less weight. I found the first Mophie battery pack I bought ages ago while cleaning out my closet and that thing was a brick compared to these. Anyway, thanks a ton to RavPower for the coupon codes, I always love passing along stuff like this to our readers. These coupon codes last through the end of the month, but I have no idea what RavPower’s stock is like on Amazon so I wouldn’t wait too long if you’re interested in any of these. Amazon Prime Free Trial – Free shipping, Amazon Prime video, Kindle books, Twitch goodies, and a bunch of other stuff bundled into one subscription. Amazon Prime Student 6-month Trial – A slightly different flavor of Amazon Prime, exclusive to students that costs half as much. AmazonFresh Free Trial – Amazon’s grocery delivery service. Amazon Home Services – Amazon vetted handymen, house cleaning, and similar. Amazon Music Unlimited Free Trial – Amazon’s answe to Spotify, Apple Music, and other similar services. Try Audible and Get Two Free Audiobooks – If you’re even remotely interested in audiobooks, Audible is the best. Join Amazon’s Kindle Unlimited – Basically the text equivalent of an Audible membership. Download the free Kindle app – The best ebook platform, largely because unlike iBooks, your library is totally cross platform. Shop Amazon Cell Phones – Wireless phones and service plans without the hassle of dealing with going to a store. If you want to take things a step further, you can check out our Patreon, but either way we just appreciate you sticking with us and continuing to both visit and contribute to the TouchArcade community over the years! If you’ve got a product you’re interested in seeing featured in an Amazon Item of the Day, don’t hesitate to reach out. The best way to get in contact with us is via email at tips@toucharcade.com and be sure to include “Amazon Item of the Day” in the subject.